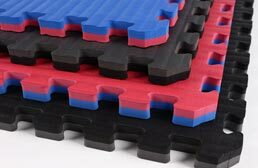 7/8" thick foam tiles are designed for heavy exercise work where extra shock absorption is needed. All of our 7/8" thick tiles are made of safe and non-toxic EVA foam that has been tested to ensure product safety. EVA foam also offers the benefit of being waterproof as well as a good insulator against temperature and sound transmission. This means that work out sessions usually sound quieter in other rooms and users no longer have to worry about working out on a cold sub floor. The primary uses for 7/8" thick soft tiles are for home gyms and exercise rooms, in martial arts training studios, and any other place where a soft shock absorbing flooring or mat solution would be beneficial.